This article will thoroughly not list the hard work of working mothers or legal obstacles of going back to work after maternity leave etc. This is all about the psychological war you will face against you as a pregnant woman. People think that pregnancy gives women a weakness both physically and emotionally. A pregnant woman is a mother-to-be and she is in the brink of ending her career. By the help of her colleagues she will make this metamorphic decision easier. They actually help you to bring up healthier generations(!) It`s just the pregnant woman taking this negatively and personally. "Sweetheart do you know who will look after the baby when you`re back to work? Kids brought up by grandmothers become very spoilt. Kindergartens twist kid`s psychology you know..."
If you didn`t put on much weight then they start to blame you not eating enough. It`s not worrying about your health it is actually their envy to your Barbie look did not go away yet and this gets on people`s nerves. These are few examples of dialogues which are a bit caricaturized to put you off from life as a working-mother-to-be. I have some advice for preggy ladies: Pregnancy is not a disorder. It`s a natural state of mind and body and part of our being as a woman! Do not believe in women who say they don`t want to be a mother. They are either infertile or they haven`t found the right father for their kids yet. It`s their defence mechanism makes them to speak like this. 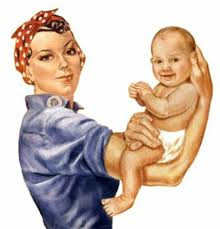 Working full time for a mother is the part of humans social evolution in the 21st century. So the ones who can achieve both who are clever enough to take advantage of the conditions to achieve this they will prove world that nothing can be more powerful than a mother!